I think maybe if you can wearing a tuxedo doing it, then maybe it shouldn’t be an Olympic level sport. 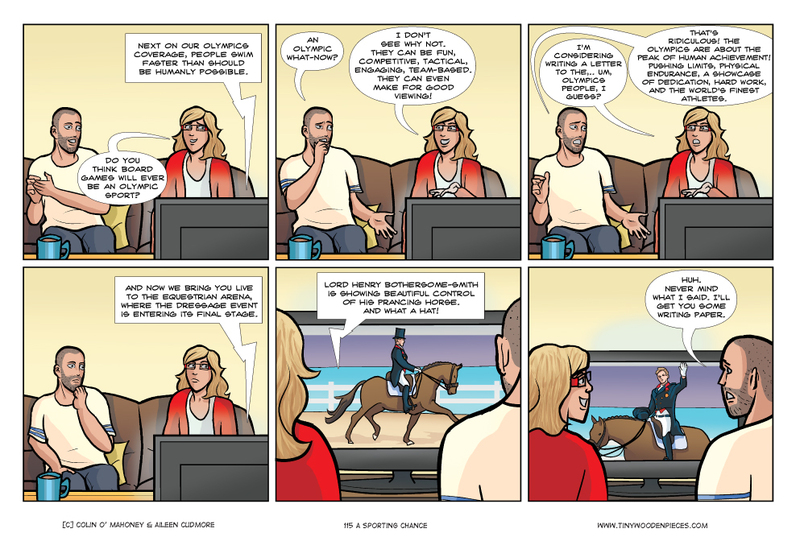 Joking (and dressage) aside, though, I do have mixed feelings about the events in the Olympics. On the one hand, I think it’s absurd that things like pistol shooting and trapping are still featured. But on the other hand, they are just modern forms of archery. If you were to weed out the sports and games whose roots are in violence and war, you would lose a shocking number of events. Martial arts, wrestling, even dressage, as Aileen has pointed out to me, has its roots in training warhorses, and why should we celebrate that? The Olympics date back too far for it to be a simple matter, but it is nonetheless an interesting question. On the other hand, though, I am perfectly fine with things like board games not being featured. As nice as it would be, I don’t think it’s the right fit. Outlets already exist for those who want to play board games competitively, and that’s something that is growing all the time. Besides which, I don’t think the majority of gamers have any particular interest in making their hobby any more competitive. It’s more important to advertise the past time as a fun, social outlet that provides an engaging, memorable play experience. And you don’t have to dress formally to do it. But the horses are SO amazing! I’d still watch it to see them . . . Someone was suggesting online that all Olympic events should include one average person competing, just for reference….. I saw that on Twitter. Funny, but it would actually be really interesting. Put things in perspective a lot, and make things even more impressive. Or just hilarious. One of Ireland’s first Olympic medals was in poetry, I believe. Another was in painting. The Olympics used to have considerably more sedate events. That said, there’s a lot of legit sports involved that I question the merit of inclusion. Track and field is one thing, but rugby (I love rugby, but really)? Dressage is right up there too. I was only talking about that the other day with a friend. It was Jack B Yeat’s ‘Liffey Swim’ that got an Olympic silver for Ireland in painting. Different times indeed. I hadn’t realised chess used to be included though. That is an interesting precedent for board games. I’ve been saying it wrong! Lady Trumpet-Sauce Bothersome Smythe will be furious! Have you ever ridden a horse? It’s actually physically hard work, and you’re tired, stuff and sore afterwards. I’d say it’s a credit to the riders if people think it looks easy! I’m sure riding a horse is both physically demanding, and the degree of control required in dressage is no doubt impressive. But it is people in suits on dancing horses, which can’t help but look … odd? … next to the rest of the sports. Another thing to consider is that sport are public domain while modern board games are products of companies and the designers. Everyone can play most olympic sports, even if they need some tools for most of them. The tools can be manufactured by different companies or they can make homemade ones. Whereas if a board game becomes an olympic event, it would generate increased revenue for the publisher. Who would select the games and based on what?